As soon as I got home I started begging my father for an electric guitar, but he flatout refused to give me one. So, I took an old acoustic guitar and modified it with steel strings and a magnetic pickup I fashioned, and then I rummaged together parts to build my own amplifier. It didn’t sound great, but it worked. That was my first lesson in the science of building musical equipment. It certainly wouldn’t be my last. I realize that some Premier Guitar readers may not know that we wind our own pickups at Peavey, but that fact is that we’ve been winding our own pickups since day one with the T-60 guitar. I’ve always held the philosophy that in order to be better, by definition you have to be different. The inspiration for our new HP Special pickups – the first Peavey pickups ever offered as aftermarket components – came from the same place as many other innovative products in the Peavey catalog: dissatisfaction with what other companies are making, and input from musicians to the same end. Inconsistency is a recurring problem in so many areas of guitar making – that’s why I began using precision CNC techniques in instrument building – and it’s no different with pickup winding. The HP Special pickup is based on a patented design to ensure consistent tone above all else. We developed a flywheel winding technique to wind every pickup consistently. Some methods of machine winding can result in more wire tension on the ends of the bobbin than in the middle, and cause the pickup’s output to vary. Our method of winding keeps the tension levels consistent all around the bobbin so the tone is always consistent. Coil tapping is a standard feature on both the bridge and neck pickups on our HP Special guitars, and we’ve resolved the tone problems of coil-tapped pickups by varying the wire gauges. Most “tapped” pickups don’t sound like true single-coil pickups because they are wound as humbuckers. We wind HP Special pickups with two different gauges of wire so you get a true single-coil tone when you tap them, and humbucker tone when you run them in the standard configuration. 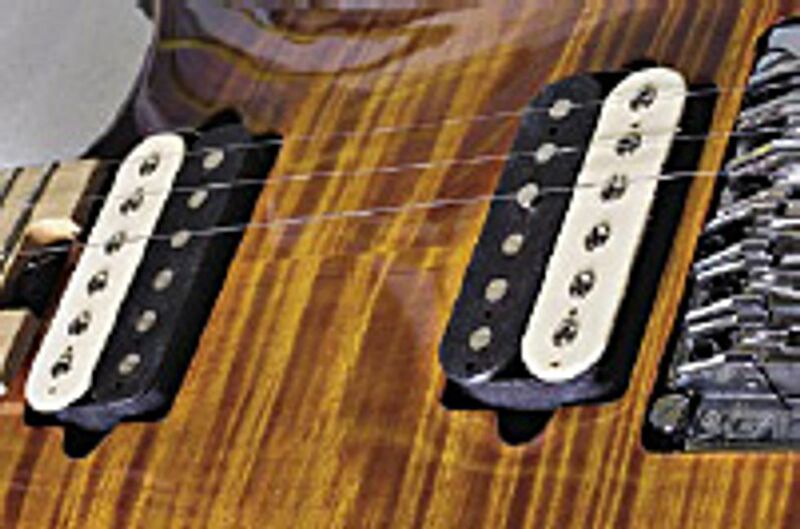 Technically speaking, HP Special pickups are four-conductor, hum-canceling pickups that use alnico magnets. The HP-B Custom, or bridge position pickup, has a balanced coil configuration that produces super harmonics with a high output and just the right blend of sustain and distortion (not harsh or dark). You get the best of both worlds: from warm, sweet tones to raw rock ‘n’ roll sustain. It measures out at 16.4k D.C. resistance with a 5.5 kHz resonant peak. The HP-F Custom, or neck position pickup, is voiced to produce accurate, clear tone for fast, articulate runs. Its brighter sound has slightly less output that makes it a good match with the HP-B. It measures out at 7.72 k D.C. resistance with an 8.0 kHz resonant peak. Dating back to my first encounter with pickup winding, I knew that pickups were only part of the “tone” equation. The other part is matching pickups to your instrument. Some players get in trouble when they start switching out pickups haphazardly, and they kill everything that is unique and balanced about their guitar’s tone. Certain wood combinations are matched together for a reason, like mahogany and maple or basswood and maple, and so should pickups be matched to your guitar’s woods, and even your amplifier. HP Special pickups are voiced to give an accurate representation of the sound of your instrument. Caveat: some folks would have us believe there is magic in how musical instruments are made. As much as I’d love to tell people that our pickups sound great because we wind them under a full moon in a Mississippi swamp, that simply isn’t true. “Magic” is just a way to describe things we can’t understand. Once we understand them, they become science. And when you know the formula, you can do anything you want to the formula!